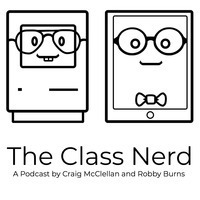 Here at The Class Nerd, we know even among teachers who want to get their work done on an iPad, there are different needs, use cases, and personalities. This applies to myself and Peter as well. While he gets a lot of his lesson planning for high school math done in OneNote, his system doesn’t work as well with the way my brain works or with a 2nd grade, general education classroom. In my 3 years of teaching and discovering how to write the best plans for me and my students, I have found plans tend to fall somewhere on a spectrum between being able to see a full week with brief descriptions of each lesson to incredibly detailed daily plans akin to those I was required to write in grad school which can take an hour each to write. I have tried apps at all points on this spectrum in an attempt to learn what works best for me. I began with weekly spreadsheets in Numbers, and swung as far to the other side as writing out detailed plans of every day in Ulysses, my primary text editor. What I have learned is I actually prefer my plans in the middle of the range with an ability to switch between views. This has ultimately led me to Bear. I was first introduced to Bear by Federico Viticci as he was attempting to use it as his primary note taking app. As I have discussed before, I’m actually quite happy with my note-taking workflows, and Bear lacks too many features I need in my primary notes app such as Apple Pencil support, rich previews of links and other content, and background syncing from the sharing extension. But there was always a part of me that knew even though Bear wasn’t the app for me, I wanted to try it. I realized while Bear wasn’t a great note taking option, it might be perfect for my lesson plans. I’m still giving it a try, but after a few weeks, I’m really excited about the possibilities as I move into a new semester. Bear stands out among other apps I’ve used for lesson planning in two areas: writing and organization. One of the primary features which has made Bear so appealing for people as a note taking app is its support for writing in Markdown. This is also why it works so well for me as a lesson planning app. For years I have longed for the ability to write my lesson plans in Markdown because I can write so quickly and still make something readable with nice formatting. While Bear uses its own, slightly different variety of Markdown, it does have a “Markdown Compatibility Mode” setting which allows you to use standard Markdown. Bear also shows your Markdown formatted properly making it easier to read. Bear also has an extensive URL-scheme allowing for automation using apps like Drafts and Workflow. The team at Workflow also recently updated the app with several Bear actions making it even easier to automate adding information to notes in Bear. I created a Workflow helping me fill out a template lesson plan with the lesson date, subject, and unit tags (more on tags in a bit) for that lesson. While it is highly specific to how I like to write plans and my school district’s curriculum, hopefully you can adapt it to your own needs. You can download the Workflow here. If you need help understanding what I’m doing with dictionaries in this Workflow, I recommend this episode of Canvas where Fraser Speirs gives an excellent explanation of lists, dictionaries, and how they work. Automating this process saves time and ensures my organization system stays in shape. The developers of Bear have put a lot of thought into how users can organize their notes. They have included 3 primary tools I use regularly: note links, pinned notes, and tags. Note links are perhaps my favorite aspect of Bear. By enclosing the title of another note in double brackets, you can create a tap-able link to that note. 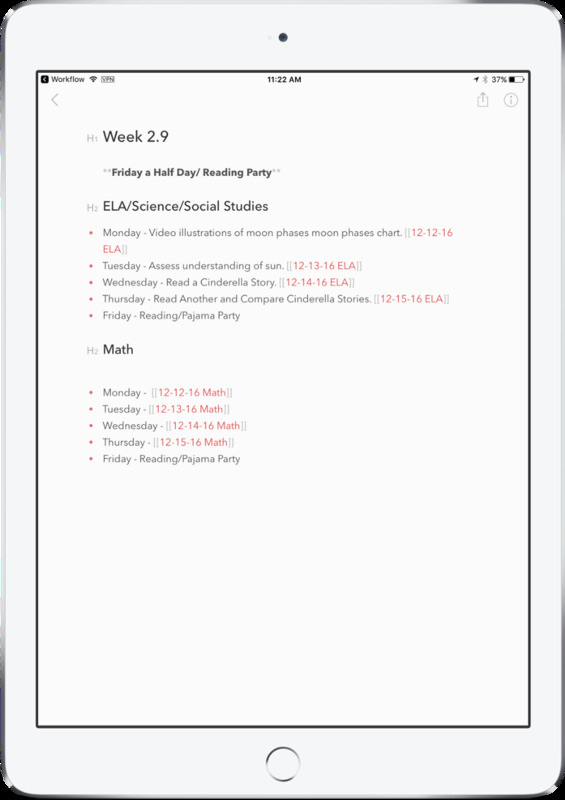 I use this to create one note for each week with links to lesson plans for each subject on each day along with a brief description of the activity. This gives me the full week view I desire while still making it easy to get more details if I need it. I use Bear’s ability to pin notes to the top of the list to keep the current week’s overview note at the top of my list so I never have to worry about finding it. The final way I like to look at plans is by unit. My school district groups our standards into units by topic or theme, generally 2–3 major units per subject per quarter, so I create a tag for Science Unit 3 or Math Unit 5. My school is also an IB school, so all of our curriculum is tied to one of the 6 IB PYP units. I have tags for these as well. This helps me make sure the flow of my instruction makes sense with regard to each unit, and that I cover everything I am required to cover. As I look to the future, I’m hoping my increased productivity along with a better system for writing and organizing plans in Bear will save me time and allow for richer, more well thought out lessons. My main concern with using Bear is overwhelming the system as I continue to add more and more similar notes. But only time will tell on this. For now, I’m quite happy and feel more prepared for my daily lessons than I have in a long time.